The Duke of Sussex is also said to be overly-protective about his wife because 'he couldn't do the same for Princess Diana'. A Palace insider told The Sun: 'It's my opinion that Harry feels he couldn't protect his mother, so he's going all out to protect his wife. This is his way of atoning. Harry then reportedly 'went mental' and accused his brother of trying to finish their relationship before it had started. Other royals are thought to have expressed their concerns to the Duke of Sussex. Kensington Palace refused to comment when approached by MailOnline. It comes after the Duke and Duchess of Cambridge failed to attend a board meeting of the Royal Foundation this week amid rumours of a royal rift with the Duke and Duchess of Sussex. William and Kate lead the foundation together with Harry and Meghan but while the Duke and Duchess of Sussex both attended the meeting, as well as a staff Christmas party afterwards, the other two members of the so-called Fab Four didn't show up. Kensington Palace insists that the Cambridges were not expected, but a source admitted that it 'was a shame' they didn't attend the meeting or the subsequent party. 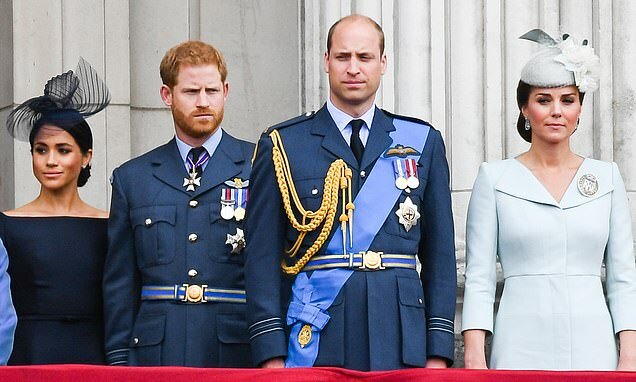 Rumours of a rift between the Cambridges and the Sussexes have spread like wildfire following the announcement that Harry, 34, and Meghan, 37, are set to move away from Kensington Palace to Frogmore Cottage. And the latest chapter of the rumoured rivalry saw Harry and Meghan attend the board meeting alone.